RITMA’s goal is to provide a dynamic association for qualified professionals detaining a valid diploma issued by a recognized school. RITMA has a code of deontology which must be strictly adhered to by all its members. 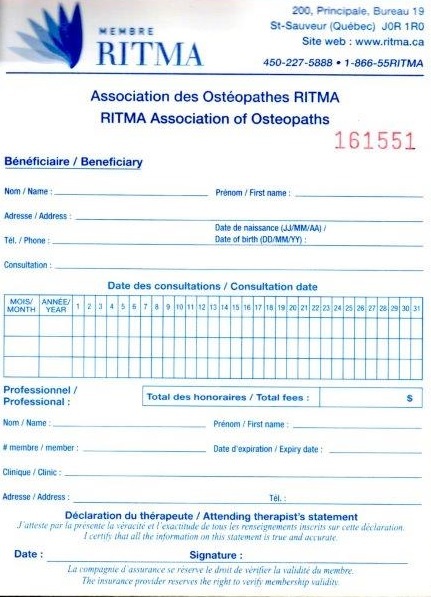 RITMA members are recognized by most insurance companies, which allow the therapist to issue receipts for services rendered to their clients, who in turn submit to their private insurance companies for refund. RITMA pledges to direct all potential clients to the member therapist in or near his neighbourhood. RITMA plans at least one para-professional activity per year for its members and their guests. This provides a great opportunity to share with peers and friends as well as have a great time! RITMA encourages its members to seek continued education and perfecting classes for their chosen profession, consequently, it offers these courses at a reasonable cost. RITMA has specific requirements when welcoming a new member. The applicant is expected to have a diploma issued by a school recognized by RITMA and successfully complete a practical exam. A written exam may be required when the practical exam grade is below 73%. This is to ensure that all its members are adequately qualified to practice their profession.